Here are a couple more photos of Mrs. Harris' class. The kindergarten classes have been busy lately. We have been learning about beat and no beat and how to move to show the beat. 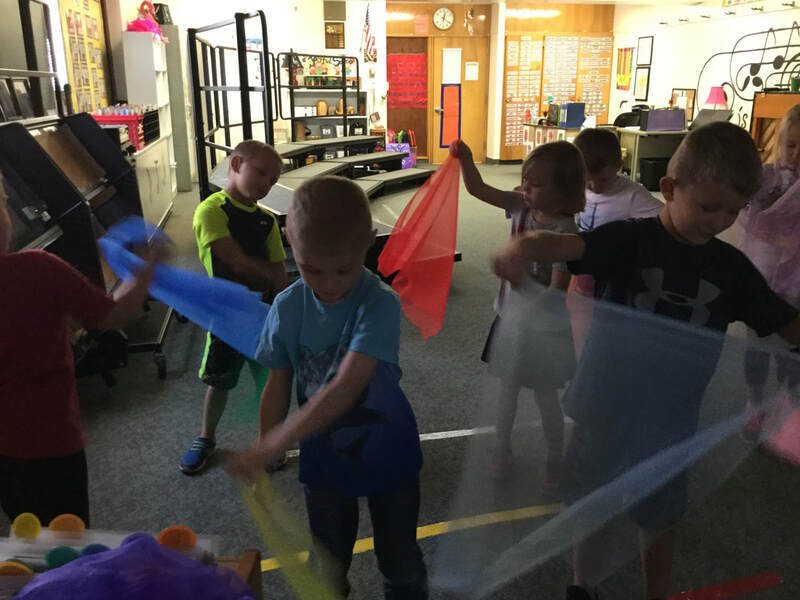 Today with Mrs. Trevorrow's class, we used scarves to show the smooth connected tones of the song we listened to. Welcome to elementary music. This year your child will be introduced to Quaver music and using SeeSaw in the classroom. They will be learning about classroom rules and rhythm our first week back. Throughout the year, I will be posting photos and/or videos of activities during class. Please see the Fine Arts calendar in the links to the left. It lists all events for the year. Look under the heading "Group Involved" to find when your child will have a concert. I look forward to meeting your child. We completed our work on Lucy Locket. The students have been working very hard learning the difference between beat and rhythm. They have decided that beat is easier. I just wanted to share some of Mrs. Trevorrow's students getting a chance to work with the iPads yesterday. We had a great time working with the random spinner to move our bodies to the beat. The students were able to try tapping to the rhythm. They thought that was much harder than tapping to the beat. Such an exciting day for our kindergartners today! The students received their classroom iPads on Monday. We began learning how to find our Quaver backpack app and how to scan the qr code to send us to the same slide that the smart board is on. 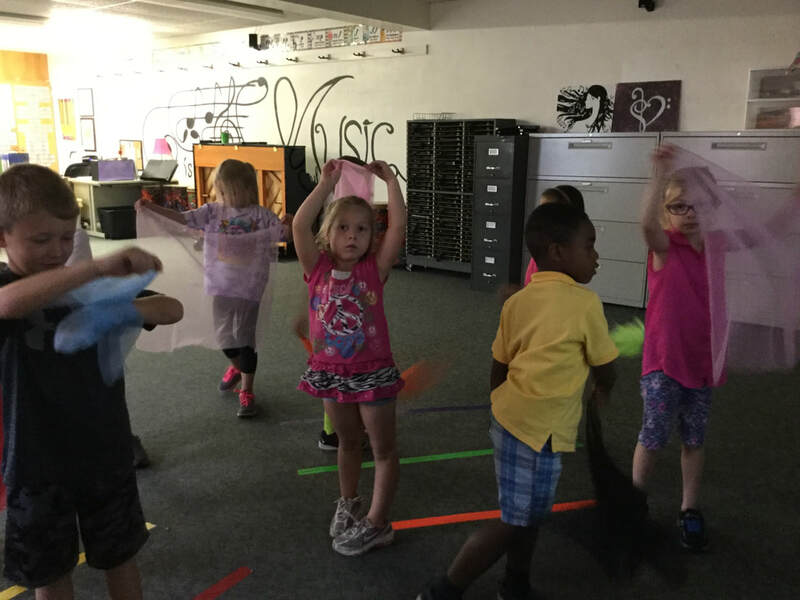 We have been learning Lucy Locket through the song-based lessons in our Quaver music curriculum. The kids took turns playing Lucy Locket and tapping the hearts to the beat of the music and the pockets to the rhythm. On another slide they were able to play the music, spin the dial and then keep the beat with whichever body part popped up on the screen. The students had a great time learning about beat and rhythm today. Can't wait until our next class! We are so excited for a year of kindergarten. We have been getting used to the music classroom and all the changes. The students are enjoying getting to know each other and learning new songs with "Quaver". Can't wait to share some songs and more pictures from class! We had a light week this week. We reviewed Time For School, learned School Is Cool and The Beat is the Heart of Music. We also learned Put Your Finger in the Air and My Head and My Shoulders. The kinders will be learning about loud and soft this next week. Welcome to the kindergarten blog page. I will be posting photos or videos (hopefully) weekly of activities that we will be doing in class. We started this week by taking our class photos and playing some get to know you games. The students learned their first song as well. We sang "Time for School" and did movement around the classroom. Watch our site for updates. Glad to have you here!